turtleneck collar w. picot edge. making combines knitting and crochet. wool/merino or blends will work best for this pattern. Thank you all for your interest in the pattern! 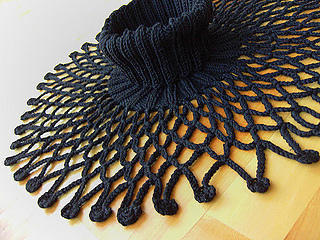 The PDF added to Ravelry is a “printout” of the blogposting (meanwhile offline). It contains all information needed to make this neckwarmer, but it won’t be revised or updated. Please note that it’s for personal use only.